The Scientific Python conference was held in Austin, TX, July 6–12, with around 500 attendees. SciPy is a community dedicated to the advancement of scientific computing through open source Python software for mathematics, science, and engineering. The conference this year had two specialized tracks: scientific computing in education, and geospatial data in science. Prof. Lorena Baba gave the opening keynote, addressing the pedagogical value of interactive computing in engineering education. 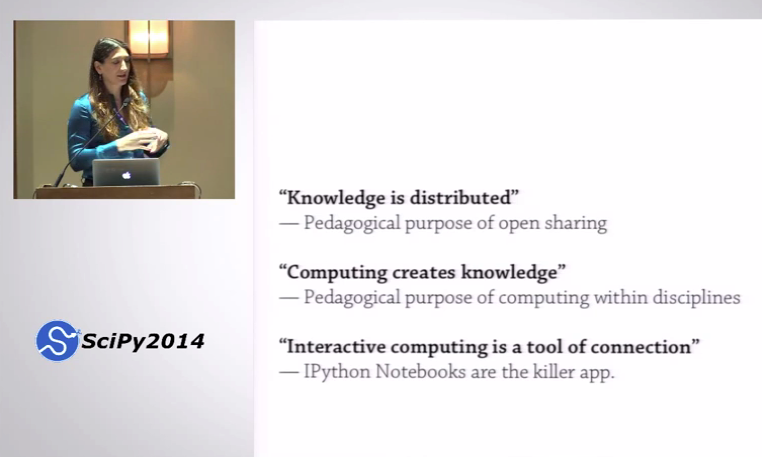 #scipy2014 keynote @LorenaABarba says "Computing is a form of learning..."
@LorenaABarba kicked off #SciPy2014 today with IPython notebook and its huge benefits for education. Great talks on education followed. Loved the talk and really looking forward to the MOOC. I hope to participate in SciPy again. Loved it. Thank you for leaving a comment, Nicolas. I really valued the opportunity and had a ball at the conference.